Wildlife does not try to maliciously annoy people! In many cases, people have turned wild animals into "delinquents" and created problem animals by providing them with easy food. 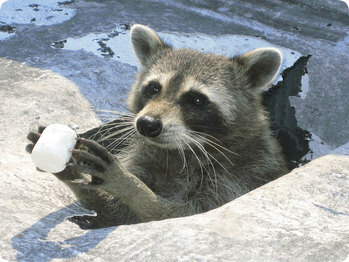 Giving raccoons food is an invitation for them to come back. Photo courtesy of Nationwide Wildlife Removal. ​To avoid uninvited wildlife being attracted to bird feeders and outdoor grills you may want to bring these inside at night. To avoid uninvited wildlife being attracted to bird feeders and outdoor grills you may want to bring these inside at night. Keep all pets indoors or under control. Dogs and cats are invasive predators that humans have introduced into nature. They disrupt the balance of nature and can, in turn, meet sad fates themselves. Some government agencies give pet owners hefty fines if their animals chase, harm, or kill wildlife. 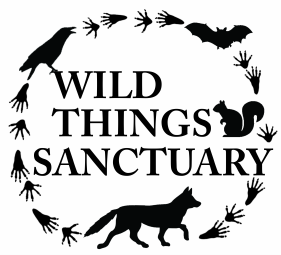 See Cats & Wildlife for more information. 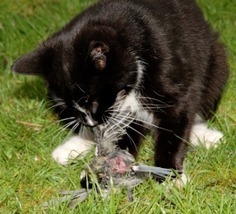 Pet cat killing a native chickadee. Photo courtesy of Missouri River Bird Observatory. Come up with a comprehensive wildlife proofing plan; restrict access to buildings by repairing holes, cracks, and closing doors and windows. Open areas such as chimneys may have a screen placed over them to prevent wildlife access. For more information see below. 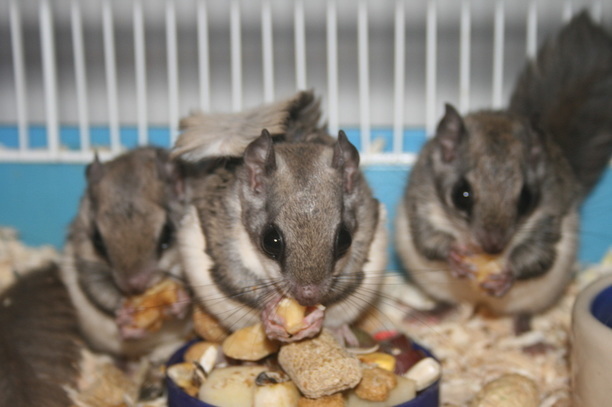 Flying squirrels are adorable, but may not be so cute if they end up living in your house. If an animal starts digging a den near your home, don’t panic and use extreme measures resulting in the death of the animal. A new animal will move right on in, and if poison is used, non-target animals, such as pets and raptors, may end up dying. Instead, place some ammonia on a rag and place in the hole. Check for animal nests before working on your house or yard (e.g., cleaning the chimney, mowing the lawn, cutting down trees, etc). Try to avoid disturbing nests; in most cases wildlife babies will grow quickly and leave the premises within a few weeks. Call a professional and/or wildlife rehabilitator if a nest must be disturbed.